Do you know somebody that’s graduating this summer and want to get them a special gift? If they love the speed and adrenaline of motoring sports, our gift vouchers give them a ticket for one of the best driving experiences in the UK. Our One Day Intense Course gives participants the chances to drive real rally cars on genuine forest rally stages in the centre of Wales. You’ll be introduced to winding roads overlooking stunning views, with plenty of mud, shale and natural obstacles. Our hands-on driving days are also great for anybody looking to visit a beautiful part of Wales. Our gift vouchers are perfect for all sorts of occasions, from birthdays and anniversaries to graduations. We promise a phenomenal day out for everybody. We attract drivers of all ages from across the UK and beyond. Praised for our ‘professional, fantastic and fun instructors’, Phil Price Rally School promise an incredible adrenaline rush for everybody involved, including spectators. 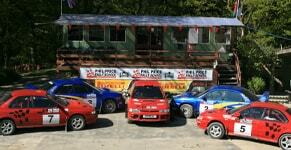 Phil Price Rally School have been in the business since 1989 and still have the same passion we’ve always had for this motorsport. 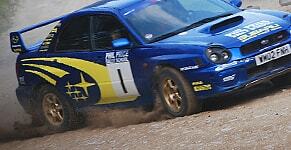 We promise loads of time in our fully prepared Suburu rally cars with as little time spent on theory as possible. Why not find out what previous participants think?